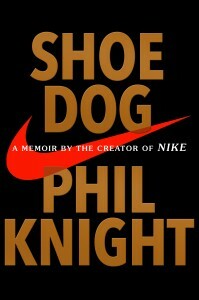 Phil Knight’s Memoir SHOE DOG to be Published by Scribner on April 26 | News and Corporate Information about Simon & Schuster, Inc.
NEW YORK, January 28, 2016—Scribner will publish the legendary creator of NIKE, Inc. Phil Knight’s first-ever memoir on April 26, 2016, leading a worldwide publication by Simon & Schuster’s publishing companies in Australia, Canada, India, and the United Kingdom. Titled Shoe Dog, the memoir will focus on the founding years of Nike, offering the inside story of the company’s early days as an intrepid startup and its evolution into one of the world’s most iconic, game-changing, and profitable brands. A simultaneous audio edition, for which Phil Knight will read the introduction, will also be available on compact disc and digital download from Simon & Schuster Audio. In 1962, fresh out of business school, Phil Knight borrowed $50 from his father and created a company with a simple mission: import high-quality, low-cost athletic shoes from Japan. Selling the shoes from the trunk of his Plymouth, Knight grossed $8,000 his first year. Today, Nike’s annual sales top $30 billion. In an age of startups, Nike is the ne plus ultra of all startups, and the swoosh has become a revolutionary, globe-spanning icon, one of the most ubiquitous and recognizable symbols in the world today. But Knight, the man behind the swoosh, has always remained a mystery. Now, for the first time, he tells his story. Candid, humble, gutsy, and wry, he begins with his crossroads moment. At 24, after backpacking around the world, he decided to take the unconventional path, to start his own business—a business that would be dynamic, different. Knight details the many risks and daunting setbacks that stood between him and his dream—along with his early triumphs. Above all, he recalls the formative relationships with his first partners and employees, a ragtag group of misfits and seekers who soon became a tight-knit band of brothers. Together, harnessing the transcendent power of a shared mission, and a deep belief in the spirit of sport, they built a brand that changed everything. One of the world’s most influential business executives, Phil Knight is the creator of NIKE, Inc. He served as CEO of the company from 1964 to 2004 and continues to this day as Board Chairman. Scribner is an imprint of Simon & Schuster, Inc., a part of CBS Corporation. Simon & Schuster is a global leader in the field of general interest publishing, dedicated to providing the best in fiction and nonfiction for consumers of all ages, across all printed, electronic, and audio formats. Its divisions include Simon & Schuster Adult Publishing, Simon & Schuster Children’s Publishing, Simon & Schuster Audio, Simon & Schuster Digital, and international companies in Australia, Canada, India and the United Kingdom. For more information visit our website at www.simonandschuster.com.